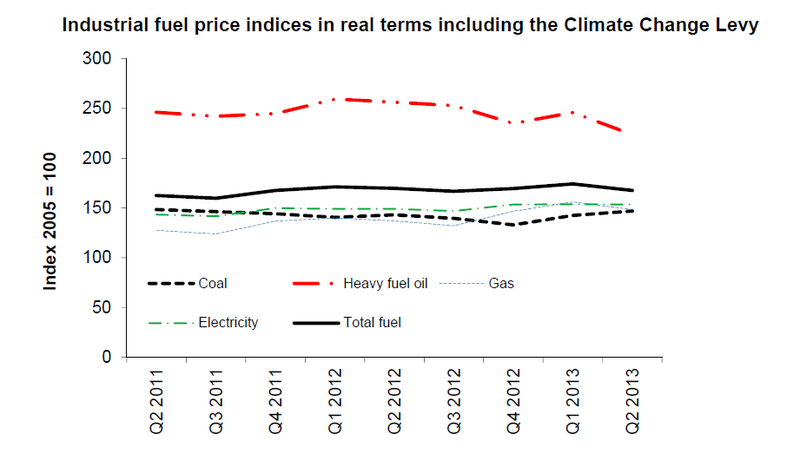 Energy Trends and Quarterly Energy Prices are published by the Department of Energy & Climate Change (DECC) and OFGEM. This page provides a summary of key data for the second quarter of 2013. Download the EDW Energy Trends and Quarterly Energy Prices Q2 -2013. 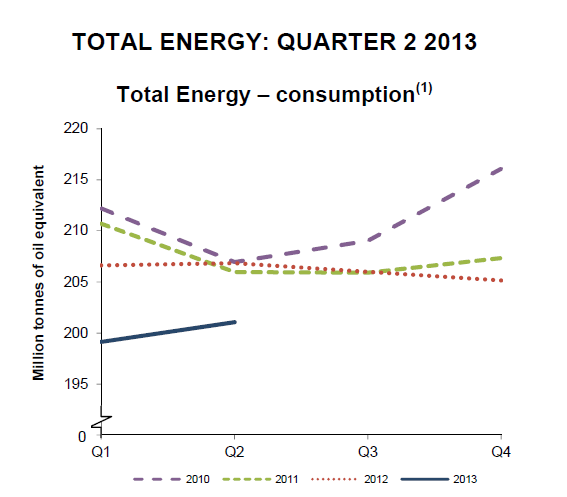 Final energy consumption was 1.5 per cent higher in the second quarter of 2013. On a temperature adjusted basis, final energy consumption (excluding non-energy use) was broadly unchanged, with domestic consumption down 2.6 per cent. Primary energy consumption for energy uses fell by 2.3 per cent, and when adjusted to take account of weather differences between the second quarter of 2012 and the second quarter of 2013, primary energy consumption fell by 2.8 per cent. Total energy production was 9.4 per cent lower than in the second quarter of 2012. Oil production fell by 13.4 per cent, with falls in both nuclear output and coal extraction. Production of natural and other gases fell by 2.4 per cent, a lower rate of decline compared to previous quarters, due to the partial re-opening of production in the Elgin area. Of electricity generated in the second quarter of 2013, coal accounted for 35 per cent, whilst gas accounted for 28.5 per cent (its lowest second quarter share in the last fifteen years, due to high gas prices). Switching rates amongst consumers fell by 17% for electricity and 14% for gas between Q2 2012 and Q2 2013. Electricity switching rates are at their lowest level since DECC records began in 2003. Average industrial gas prices, including CCL were 8.4 per cent higher in real terms in Q2 2013 compared to Q2 2012, whilst prices excluding CCL were 8.6 per cent higher. Average industrial electricity prices were 2.9 per cent higher including, and 3.4 per cent higher excluding, CCL in real terms, in Q2 2013 compared to Q2 2012. Average coal prices were 2.6 per cent higher in real terms including CCL and 2.9 per cent higher excluding CCL in Q2 2013 compared to Q2 2012. Heavy fuel oil prices were 12.7 per cent lower in real terms than a year ago. For the period January to June 2013, prices for industrial electricity consumers including taxes were above the EU15 median for all consumers except small consumers, which were at the median. UK industrial gas prices were the lowest or second lowest in the EU15 for all sizebands of consumer including and excluding tax. Total inland consumption on a primary fuel input basis was 201.1 million tonnes of oil equivalent in the second quarter of 2013, 2.8 per cent lower than the same quarter in 2012. Between the second quarter of 2012 and the second quarter of 2013, coal and other solid fuel consumption fell by 2.6 per cent. Gas consumption fell by 4.1 per cent as less gas was used in electricity generation. Oil consumption remained broadly similar to the levels in the second quarter of 2012. Primary electricity consumption fell by 7.4 per cent. Final energy consumption was 1.5 per cent higher in the second quarter of 2013 compared to the same quarter a year earlier. The average temperature in the second quarter of 2013 was 0.2 degrees Celsius colder than the same period a year earlier. On a temperature corrected basis, final energy consumption was down 0.1 per cent over the same period. Fuel used by generators in the second quarter of 2013 was 4.4 per cent lower than in the second quarter of 2012. Generation from coal in the second quarter of 2013 fell by 7.0 per cent, while gas fell by 6.3 per cent compared with a year earlier. Nuclear fell by 16.5 per cent. Renewables generation was up by 55.7 per cent. Low carbon generation accounted for 34.1 per cent of generation in Q2 2013, which was a 2.7 percentage points increase from the same period last year. Total electricity generated in the second quarter of 2013 was 2.7 per cent lower than a year earlier. Final consumption of electricity provisionally fell by 1.4 per cent in the second quarter of 2013. Domestic use increased by 0.2 per cent, due to temperature differences between Spring 2012 and 2013. Download the EDW Energy Trends and Quarterly Energy Prices Q1 -2013.